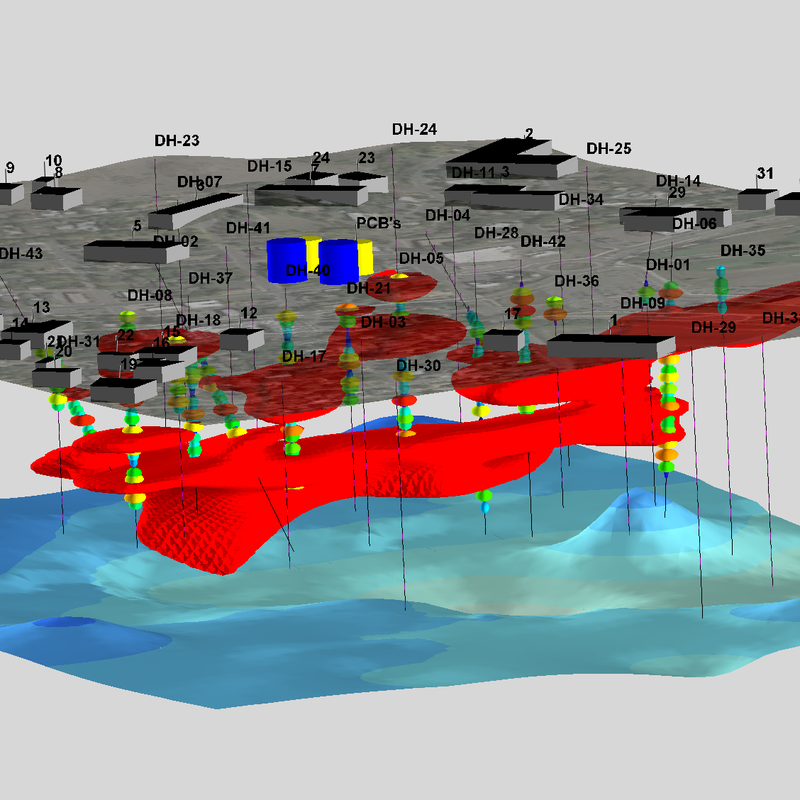 RockWorks is a comprehensive software program for creating 2D and 3D maps, logs and cross sections, geological models, volume reports, and general geology diagrams for the environmental, geotechnical, mining, and petroleum industries. 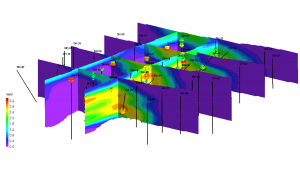 RockWorks is the standard in the petroleum, environmental, geotechnical and mining industries for surface and subsurface data visualization, with popular tools such as maps, logs, cross sections, fence diagrams, solid models and volume calculations. 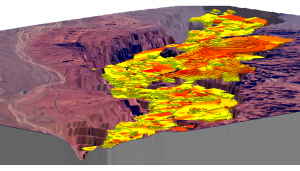 RockWorks offers numerous options for analyzing your surface and subsurface data, and accepts many different data types, such as stratigraphy, lithology, downhole geochemistry / geophysics / geotechnical measurements, color intervals, fractures, and aquifer data. Display RockWorks graphic output in its built-in 2D and 3D viewing/editing windows, or export to CAD, Google Earth, and other GIS programs. Use the ReportWorks module to create page layouts for reports and posters. 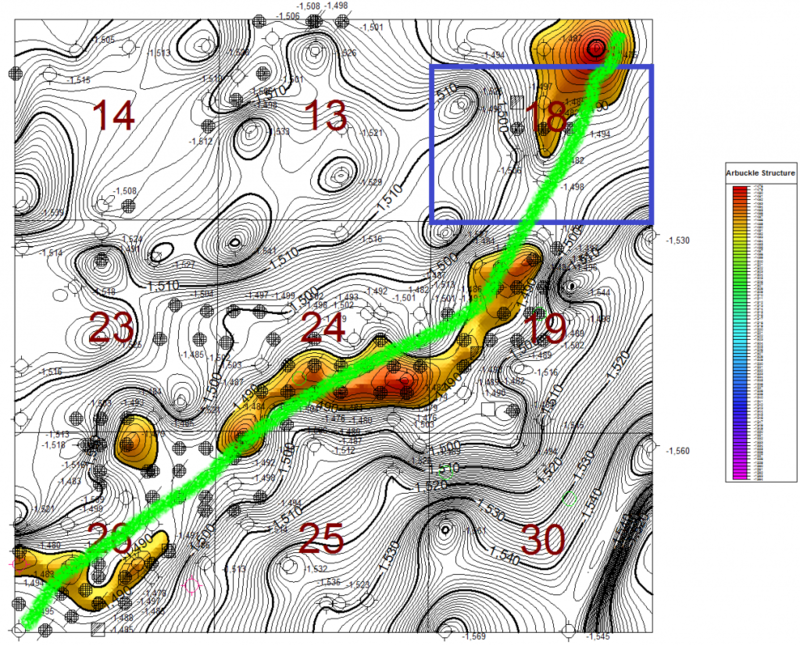 Basic: All Utilities programs, plus Borehole Manager maps, logs, log sections. Advanced: All Standard level tools, plus SQL-server database support, program automation (scripting), 3D faulting, Borehole Manager petroleum production diagrams. See the Feature Levels page for more information, or refer to the RockWorks product brochure. See also the descriptions about the RockWorks Utilities and Borehole Manager. New in RockWorks 17: 64-bit, multi-threading, more robust databases, 3D faulting and more! RockWorks17 is offered with three different feature levels: Basic, Standard, and Advanced. Which is right for you? 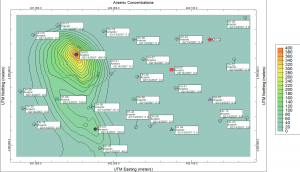 The flexibility of RockWorks has made it a popular software program for generating maps, models, cross sections, and diagrams in numerous earth science industries. Use RockWorks to represent your data with dozens of different map types: Points, contours, range-township-section boundaries, images, geology, and many specialty maps. Create individual logs or multi-log cross sections and maps in 2D and 3D. Arrange log columns using the interactive design windows. Display both vertical and deviated/inclined wells. Create single- and multi-panel 2D cross sections through surface-based and block models of interpolated data: lithology, stratigraphy, geochemical/geophysical data, fractures, aquifers, colors, and vectors. 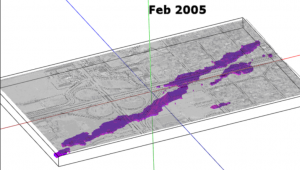 Create three-dimensional slices through surface-based and block models of interpolated data: lithology, stratigraphy, geochemical/geophysical data, fractures, aquifers, colors, and vectors. Include logs, coordinate labels, titles. Use RockWorks to interpolate continuous 3D "solid models" or "block models" of simple XYZG points or sub-surface borehole data, for display in 3D or sliced as cross sections. Create detailed reports and models, as well as interactive views of volume computations of ore / soil or rock materials / contaminants. 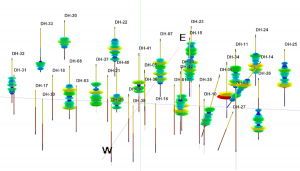 Display and model different types of downhole data: lithology, stratigraphy, aquifers, quantitative measurements, fractures, colors, and more. 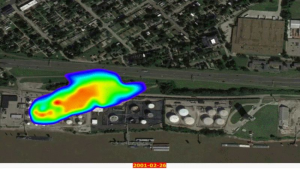 Create Google Earth output from source data - point maps, flyovers, contours. 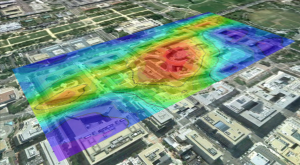 Export to Google Earth from RockPlot2D and 3D - maps, models, cross sections. 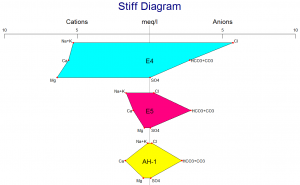 Create Piper, Stiff, Durov and other hydrochemistry diagrams, calculate water level drawdown and generate hydrographs. 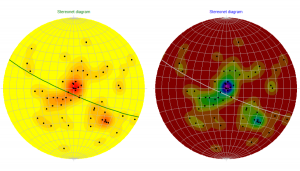 Use RockWorks to generate rose diagrams and stereonets - individual and in map displays - as well as strike and dip maps, lineation maps, and more. RockWorks offers many import and export options for data, graphics, grid models and solid models to provide connectivity to other software programs. What operating systems does RockWorks support? RockWorks17 should install, license, and run properly in Windows 7, Windows 8, and Windows 10. It is available with both 64-bit and 32-bit versions. The 64-bit version supports larger models and faster processing, and requires a 64-bit version of Windows. What are the system requirements for RockWorks17? The EarthApps and Google Earth exports require installation of Google™ Earth, available from Google. The RockWare Network License Administrator - for network licenses - runs under Windows Server 2008 (or newer) or Windows 7 (or newer). You'll have better results with more RAM, a faster processor, and enhanced video (graphics card with dedicated RAM) for modeling and 3D display. Large Fonts are not recommended. Windows XP, NT, 2000, 98 and ME are not supported. See our detailed FAQ page for more frequently-asked questions regarding RockWorks. What are the different types of licenses available for RockWorks? A Single license can be installed onto a single computer. It is activated with a code specific to that computer, issued by RockWare. The license can be transferred to a new computer or different user by following the transfer instructions listed below on this FAQ page. This license can be upgraded to a different license type or feature level by paying the difference in price. An Annual license can be installed onto a single computer. It is activated with a code specific to that computer, issued by RockWare and valid for 1 year. When the year is completed, the software reverts to “free” mode. The license can be renewed by paying the Annual fee again at the current pricing. The license can be transferred to a new computer or different user by following the transfer instructions listed below on this FAQ page. This license cannot be upgraded to a different license type or feature level within the license year. A Network license is a shared license type. Any potential user may install RockWorks on their local computer. A separate License Manager program is installed on a server or other network computer and activated for X number of concurrent users. When a person launches RockWorks on their local machine, it looks to the License Manager to see if a seat is available and, if so, it will start. The License Manager can be configured to permit users to borrow a license when not connected to the network (e.g. in the field) for up to 60 days. Multiple seats must be at the same feature level. Additional seats can be added by paying the difference in price. A Classroom license is offered to academic institutions at a highly discounted price and is a bundled license, comprised of a Single license (typically for the instructor) and a Network license (for the lab). RockWorks17 is also available with more feature levels so that you can purchase just the tools you need. Please visit our Feature Levels page for more information. How do I choose which level of RockWorks to buy (Basic, Standard, or Advanced)? With Basic, the borehole processing tools are limited to borehole location maps, 2D and 3D strip logs, and striplog profiles and cross sections. 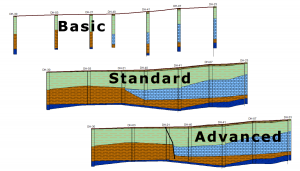 Simple correlation panels are offered for Stratigraphy, I-Data, and P-Data in 2D section diagrams, but otherwise the borehole visualization is limited to observed data – no modeling. 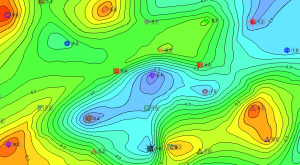 With Standard, you get all of the 2D and 3D modeling capabilities for lithology, stratigraphy, geochemical / geotechnical / geophysical, fracture, aquifer, and vector data, plus all of the 2D and 3D diagrams and maps you can generate to represent the models. The higher levels include all of the features of the lower ones. You can upgrade to a higher feature level by paying the difference in price. How do I download the RockWorks demo? Go to the main RockWorks product page. Click the Captcha check-box, and click Continue. The Free Trial tab will now display instructions and a Download link for both the 64-bit (recommended) and 32-bit versions. Click one of the Download links. How do I install and activate my RockWorks17 license? When you purchase a license for RockWorks, you will receive an email from our fulfillment desk with the "registration number" for your license. Keep this - you'll need it to activate your license. RockWorks17 installs as a demo. You can download the installer from the main RockWorks page on our website. Save the installer file to your computer, then run it to install the software. The trial version is fully-functional for 2 weeks. How do I transfer my RockWorks17 Single license to a different computer? This is a 3-step process: removing the licensing from the original machine, installing the program on your new computer, and unlocking the license on the new computer. See also: RockWorks Licensing. Start RockWorks17 on that computer. Click on the Home tab and the Licensing button. Click the Change/Review Licensing button. Copy or write down the Uninstall Number which is displayed. NOTE: If your maintenance has expired you will need to visit the Archives Page instead to download a revision that precedes the expiration date. Click the Set Up Licensing button on the startup screen. Click in the license type you purchased and the feature level. Click the button to the right to copy this long code, and paste it into the Unlocking Code prompt in RockWorks. Enter the license's Registration Number and your Company Name into the specified prompts. How do I transfer my RockWorks17 Network license to a new server? Start the RockWare Network License Administrator program on that server or computer. Click on the name of the license you wish to remove in order to select it. Select the Licensing | Remove a License menu option. Write down (or right-click/copy and paste into Notepad) the Uninstall Code which is displayed - you'll need that in a minute. Contact RockWare Support for a download link for the Network Administrator installer. Install the software on the new server and launch it. Select the Licensing | Generate a License Request menu option. Set the Product to RockWorks17. Select the Feature Level of your license (Basic, Standard, or Advanced). Enter your license registration number and your company name into the requested prompts. Click the Get Install Number button. Write down (or right-click/copy and paste into Notepad) the Installation Number which is generated. You will need this momentarily. Once you're in the Portal, locate the license you are transferring and click the Unlock button. Enter the new Installation Number, the Uninstall Number from the previous server, the end user name and email. Click the Unlock Software button. The Unlocking Code should be displayed on the screen. Click the button to the right to copy this long code. When you have pasted in the Unlocking Code, click the Activate License button. You’ll need to supply your contact information, your license Registration Number, the new Installation Number, and the Uninstall Code from the previous server. Maintenance is offered for Single and Network licenses for RockWorks. New licenses and upgrades to RockWorks17 include one year of maintenance. Maintenance includes the support options listed on our support page, as well as 30 minutes of phone support, software updates and bug fixes, and new version upgrades. Upgrades from RockWorks17 to new versions are only offered under this maintenance plan and cannot be purchased separately. If maintenance has lapsed you need to pay the lapsed maintenance plus the maintenance renewal to get back on the plan. RockWorks was designed with numerous geological industries in mind: environmental, geotechnical, petroleum, and mining to name a few. 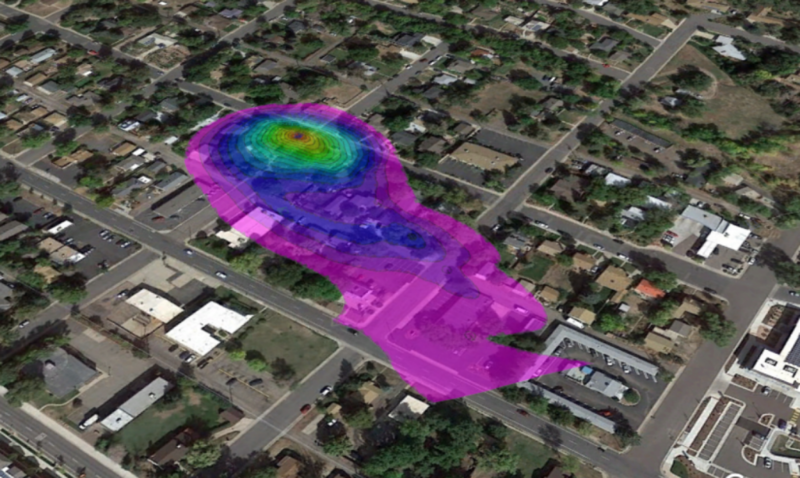 It offers many generalized subsurface visualization and modeling tools, as well as some that are more industry-specific. For example, well construction diagrams may be used primarily by environmental/geotechnical users, while raster logs and the stratigraphy picker tools might be used more by those in the oil and gas industry. 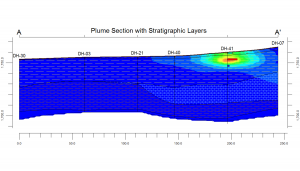 Shallow environmental data lends itself to lithology modeling, while deep petroleum wells will focus on stratigraphic layers. Mining users will probably enter quantitative measurements as “I-Data,” while oil and gas users will enter geophysical measurements in the “P-Data” tabs. 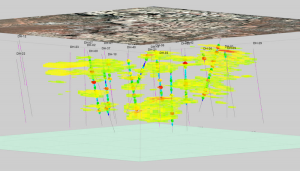 How is the borehole data stored in RockWorks? 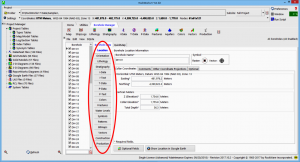 RockWorks17 stores borehole data in a SQLite database. When you create a new project folder in the program, the “SQLite” file will be created automatically for entry/import of your borehole data. This offers a number of benefits, including improved data integrity (such as defined formations and lithology types) and powerful queries (dialog-box-based as well as SQL entries). RockWorks also lets you choose MDB (MS Access) as your local database type if you prefer; this option can be helpful for connecting to ArcGIS. If you purchase an Advanced license for RockWorks17 you can connect the program to a SQL Server database on your network. Can I use my RockWorks16 projects in RockWorks17? Yes. Even though we have changed the default local database from MDB to SDB (SQLite), you can use your RockWorks16 projects with no problem. When you open your RockWorks16 project folder in RockWorks17, a new-project wizard will start. It will copy your RockWorks16 database to this new folder, updating it to the new database type. All of your accessory files – RwDat datasheets, RwGrd grid models, RwMod solid models, and Rw2D, Rw3D, and RwRpt graphic and report files are fully usable in RockWorks17. Can I use my RockWorks15 projects in RockWorks17? Yes. When you open your RockWorks15 project folder in RockWorks17, a new-project wizard will start. It will copy your RockWorks15 database to this new folder, updating it with all of the new coordinate definitions. There is also a stand-alone program installed with RockWorks17, called “RW 15 to 17 Conversion Tool” which can update - individually or in bulk - your ATD datasheets, GRD grid models, MOD solid models, and RK6 and .RW3DXML graphics generated in RockWorks15 to their corresponding RockWorks17 formats (RwDAT, RwGRD, RwMOD, Rw2D, and Rw3D). Can I create cross sections in RockWorks? These sections can illustrate logs only or include interpolated panels representing stratigraphy or water level surfaces, or lithology, fractures, or quantitative measurements based on interpolated solid models. LogPlot’s sole purpose is creating logs: it generates individual well/boring logs with almost unlimited flexibility in log layout, with detailed headers, footers, and any combination of data columns. You can create the graphic log at any vertical scale and print to single-sheet or continuous printers. If you need detailed individual logs, LogPlot is the way to go. RockWorks creates more simplified logs, designed for display in cross sections and fence diagrams, and as a launching point for project-wide data modeling and display. Logs are just a small part of what RockWorks does. Is RockWorks compatible with ArcGIS? Yes, in a number of ways. The RockWare GIS Link (available separately) can be used to load your RockWorks borehole data into ArcMap. It also allows you to pick section/fence locations there and transfer control back to Rockworks for diagram display. 2D Shapefiles can be imported into the RockWorks 2D plotting window, enabling you to overlay ArcGIS maps over your RockWorks contours, for example. The RockWorks 3D display window exports log cylinders, surfaces, isosurfaces, and fence panels as 3D shapefiles for display in ArcScene (requires the 3D Analyst extension). If you have purchased a different product from us, please review the manual for the developer's contact information. If you are unable to locate this information, please contact RockWare and we will connect you with the developer. This entry was posted on November 4, 2016 by admin.